Combine the ultimate tour of New Orleans with a morning walking tour of the French Quarter followed by an afternoon driving tour of areas outside the city center. This six-hour, private guided tour will walk you through 1.5 miles of the best known landmarks of the famous French Quarter, then explore surrounding areas by car to give you a comprehensive overview of the people, places, and history that define the city today. Stop for an optional lunch between the three hour segments at a favorite local restaurant. New Orleans has one of the richest and most diverse histories of any city in the United States. Generations of immigrants and settlers from all parts of the world have built a culture that incorporates aspects of Spanish, French, English, American, African and Caribbean culture to form something wholly unique and special. This combo tour take combines the best known parts of the city with some of the lesser visited neighborhoods to provide you a more complete overview of the city as you develop your own sense of the place. 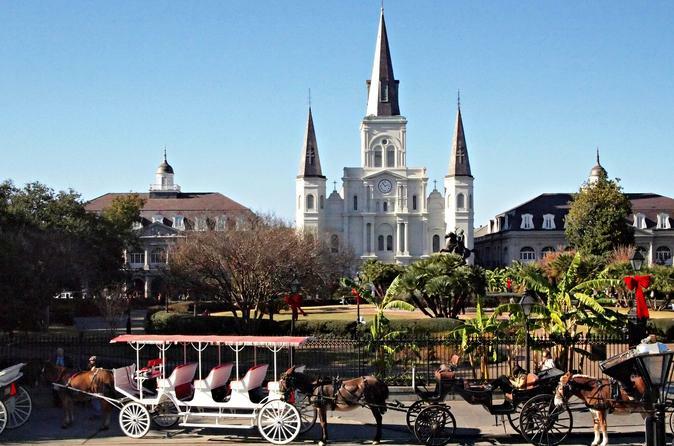 Your morning walking tour starts at 9am sharp at Jackson Square. With no more than 4 people on this small, private tour, you will have plenty of opportunities to ask questions and interact with your guide as you explore 1 1/2 miles of the famous French Quarter on foot. You'll see many of the best known landmarks, such as Jackson Square, the riverfront, the Pontalba buildings, St. Louis Cathedral, the Cabildo and the Presbytere. After three hours of learning the history of the city and photographing iconic structures, you will have an opportunity to stop for lunch and refresh before continuing on to the afternoon segment. Although lunch isn't included with the tour, your local guide will have multiple recommendations for you to fit almost any diet. The afternoon segment explores 50 miles of the city outside of the French Quarter. Along with visiting numerous historic neighborhoods and areas such as Faubourg Marigny, the Esplanade Ridge, City Park, Bayou St. John, the Lakefront, Audubon Park, the University Section, St. Charles Avenue, Tulane and Loyola Universities. and the 17th Street Canal, you will learn how Katrina devastated much of the city and how many factors continue to influence and affect the rebuilding efforts still going on today. The tour ends with a visit to the Garden District and the Central Business District followed by a drop off back at your centrally located hotel or another central location within the city.